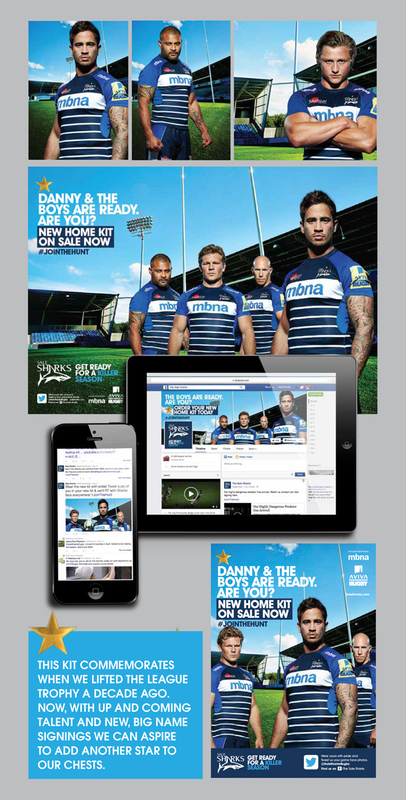 Here at Brave we’re not afraid of a tight deadline, so when our new client Sale Sharks tasked us to make some noise for their new kit launch with a turn around of just a matter of days, we rolled up our sleeves and got straight down to business. We travelled the length and breadth of the country to get to get the killer shots that would give this campaign real punch. First we sped to the stadium to capture some day and night time shots of the stadium. We knew that with our dual promotion of the new kit and the season tickets it would be great to have a clear photographic style for each piece of communication. This is something we’ve achieved by exclusively using the daytime photography for the kit launch. We worked with some of rugby’s heavyweights and shot each of them separately in front of a screen. The reason for this was that we only had one, single prototype kit to use for our kit launch material. But with clever lighting and a little bit of photoshop magic we comp’d them all together and you’d never know the difference from looking at the impressive end product. Danny Cipriani is undoubtedly the man that most fans can’t wait to see sporting the new kit, so his inclusion in the campaign was an absolute must. We were willing to do whatever it took to get the Sharks superstar fronting our campaign. This meant that we had to journey down to England’s training camp and squeeze ourselves into his hectic schedule. We waited for the golden opportunity to snap the poster boy we knew was key to our campaign and then got straight back to Manchester and onto the Mac. We seamlessly comp’d together our players and backdrops in a retouching session lasting into the early hours of the morning. A busy few days but as usual Brave delivered some impressive results in a condensed period of time. We created a whole range of material to promote the brand new kit in a striking, dynamic way; tying together our social strategy and printed materials with the hashtag “Join The Hunt”. This statement is a bold call to action that encourages fans to become a part of Sale Sharks, whether that means buying the kit, getting a season ticket or coming to cheer the team on at a game.